About seven years ago, after her husband died, Ditty moved from Florida to the East Bay, bringing, at her daughter’s encouragement, two wheelchairs and other equipment she needed to deal with the frailty of old age. Two years later, Laurel was diagnosed with a form of neuroendocrine cancer. Though it famously felled Steve Jobs, this cancer is extremely rare and difficult to diagnose. For Laurel, diagnosis led to surgery, and a resolution of serious symptoms she had for many years. Thus began Ditty’s Closet, which is located in the garages and homes of nearly twenty Kehilla members. The contents of the virtual closet are coordinated by Laurel and are available for loan to all Kehilla members, many of whom have made use of the equipment. Ditty’s Closet currently holds over 80 items of durable medical equipment owned by members including: shower benches, commodes, wheelchairs, knee scooters, and walkers — several items of which are now in circulation. With an open mind and heart, Laurel (whose last name, Zien, is pronounced Zion) spurs community, connection and acts of loving kindness. While her life’s work has taken sharp turns — traversing the worlds of theater, real estate, and gerontology — her approach is fundamentally consistent. She stays alert to possibilities, and finds opportunity in challenge. Her method is to search for the right questions. Then she develops practical ways to implement the answers. When all seems dark, she finds cracks that let in light. Over the course of five decades and three careers, Laurel has served as executive director or board member of a variety of non-profit organizations. In college she was a theater major. She went on to theater administration, producing dance, jazz, and concerts across the Bay Area. For years she was general manager of San Francisco’s Palace of Fine Arts, hosting events ranging from the Ford-Carter presidential debates to the comedian Lily Tomlin and Bill Graham’s music productions. She served for several years as associate producer at the Berkeley Rep.
Laurel was with Kehilla from its beginning and remembers its first High Holiday service at the Friends Church in Berkeley in 1984. Kehilla later found a semi-permanent home at the Northbrae Community Church in Berkeley. Part of Kehilla’s dynamic quality, and a large measure of its own identity, was in not having a building of its own. “There was tremendous resistance to having a building. The whole idea was that we were a synagogue without walls.” Laurel says. But there were drawbacks. The Northbrae Church, for instance, liked the clean look of its walls. While on the Board, Laurel was moved by a Kehilla teacher’s concern that the kids had no place to put up their artwork or hang out. Although the funding base within Kehilla was sound, Laurel said, “I was appraising churches. I knew the values in the area. It was daunting.” Laurel’s husband David, also a real estate appraiser, and several of the building committee members were professionally involved in real estate. Among them, Hal Feiger heard that the church at 1300 Grand Ave. had just come on the market and summoned the sub-group for an immediate walk-through. That was when the Eureka! moment hit. Sure, some of the classrooms weren’t ideal, but the building was affordable. From her years in the theater, Laurel had an ear for acoustics and a sense of space. She knew upon walking into the sanctuary that “this is it” — a place “where we could come together in celebration and in pain.” Keenly aware that the opportunity to buy could soon vanish, Hal moved to secure the building for Kehilla. Ironically, while Laurel and David were important players in Kehilla’s finding of a permanent home, its distance from their own home in Richmond makes their going to shul relatively infrequent. Still, Laurel remained, and remains, a Kehilla spark-plug. 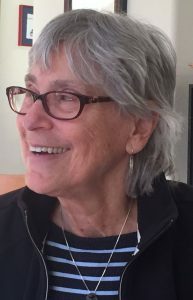 Laurel brought that background to the Chesed Committee, and launched Ditty’s Closet and other projects of loving kindness and community building. The work of the committee is confidential. Yet, Laurel sees both the giving and receipt of loving kindness as vital to community and its spiritual well-being. “It’s a mitzvah to receive as much as to give,” she says, noting that the givers feel good about doing good and the receivers make that possible, along with strengthening Kehilla’s community. About ten Kehilla members currently serve on the Chesed Committee. “Part of what we try to do is help people be clear about the kind of help they need,” Laurel says. That many of the committee members are in counseling professions is useful in this exploration. Laurel’s co-chair, Hedy, is a retired hospice nurse.